If you can walk reasonably well but just need a helping hand in the support stakes, a walking stick could be the best mobility aid for you. Walking sticks can give you extra balance when you walk or stand. However, as is the case with a lot of mobility equipment, not all walking sticks are equal. Choosing the right walking stick is vital if it's going to be of any help to you. Using a walking stick may seem like a bit of a no-brainer, but there are certain ways that you can get the most out of one. If one side of your body is weaker than the other (as may often be the case if you have a disability or other condition that affects your mobility), you should hold the stick in the opposite hand, even if this is your non-dominant hand. For instance, if the right side of your body is weaker than the left side, you should hold the stick in your left hand, even if you're a right-handed person. The bulk of your weight should be put on the stronger side of your leg. If your weaker side is the right side, most of your body weight should be on your left leg. You will obviously have to put some weight on your weaker leg, but most of the weight should fall between your stronger leg and the walking stick. When using the walking stick to get upstairs, use your stronger leg to climb the step, then use the walking stick to help push yourself up and raise the weaker leg up the step. When using the walking stick to get downstairs, do the reverse. 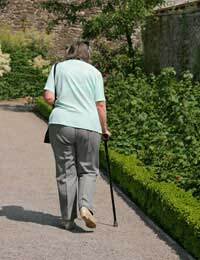 Use the walking stick to get your weaker leg down to the next step, and then lower your stronger leg down. When you place the walking stick in front of you, make sure that the distance between yourself and the stick is one that you can comfortably cover with one step. If this isn't the case, it's easy to fall and injure yourself. If you suffer from mobility problems, simply walking down the street can be an exhausting experience. If you start to feel tired, take regular breaks between steps to allow yourself to recover, and don't try to rush the walking process beyond what your body is capable of. Sensible footwear is vital, although most people with mobility problems will wear comfortable shoes anyway, as this is generally kinder to your feet. Shoes with non-slip soles are especially important when it's raining or snowing, as the ground will obviously be slippy and more dangerous. If getting out and about in these sorts of conditions are unavoidable, give yourself plenty of time to walk to your destination. Make sure that your walking stick is clean and in good condition. Regular soap and water will be enough to clean it. The base of your walking stick should have a rubber ferrule (tip). It's important to keep an eye on the general state of this, as wear and tear to the ferrule can cause the walking stick to have less grip, which ultimately compromises your safety when using it, especially in wet conditions.